If your hair is becoming grayer by the day, and your fingernails are chewed down to the quick, we’d like to offer you a chance to end the misery by telling you that Open Door Auctions can predict with pinpoint accuracy when your home will sell. Would you like us to tell you? How about two weeks from the day after you give us the go ahead to put our property marketing agents into action? Here’s the reality of the situation. A successful real estate agent is actually a successful marketer. The sales go to the agent who can get the property in front of the most pairs of buying eyes quickly. Unfortunately, the traditional real estate industry is more akin to a giant lumbering tortoise, if we were to make an animal analogy. To understand how we can make the audacious claim of selling your house in two weeks, think of us as a gazelle/cheetah hybrid, out of the gate with blinding speed and able to change course in a split second if the market demands it. There are a few reasons why we can sell your home faster than the other guys. First of all, we’re firm believers in the principle of physics that says, to paraphrase, a body at rest tends to remain at rest, while a body in motion tends to remain in motion. 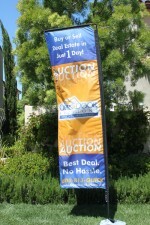 Once you give us the go ahead to sell your house, we are in motion and stay that way until the final bid is counted. It’s really that simple. We work smarter and harder than the other guys. It’s a different approach. Energy and making things happen quickly is a largely unfamiliar concept to an old-fashioned real estate agent. That’s why your sign sits in the yard, the bright cheery paint turning to rust as the seasons pass. Meanwhile, we’re conducting home sales almost every weekend and getting darn good prices for them. And that’s how we can successfully predict your home sale.